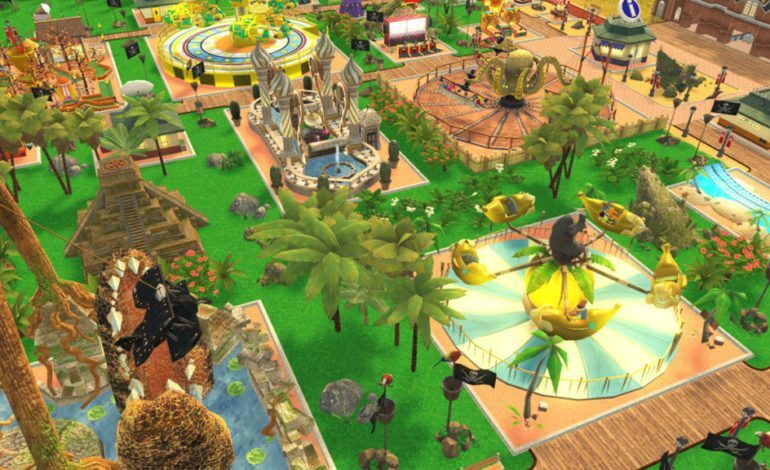 RollerCoaster Tycoon Adventures is coming to the Nintendo Switch soon and it will be borrowing assets from a couple of its previous titles to bring the series into the newest generation of consoles. Nvizzio Creations has been hard at work to give the game a fresh new look and has added a plethora of features that will utilize the mobility aspects of the Switch. There are three game modes: Campaign, Scenarios, and the open Sandbox where players can build over two hundred rides, shops, and themes. All of these can be personalized with over fifty different color sets. Of course, the game will again allow players to customize their own personal roller coasters to reel in the NPCs with thrilling loops and first hills and they will be able to do so with the quality of a console at home or on the go. The land that a park resides in can be modified with paths, plants, and water tiles in the four unique environments: Moon, Canyon, Tropics, and Alpine. A first for the series, RollerCoaster Tycoon will have an Event System. This will entail making consequential decisions that will affect the park in tough ways depending on how the player chooses. Adventures runs at a smooth 1080P while the Switch is docked and 720P in handheld mode. The game will only require 4GB of hard disc space for installation. RollerCoaster Tycoon Adventures is coming soon to the Nintendo Switch with a general release set for quarter four of the business’s 2018 fiscal year. Check out our previous discussion on Atari’s crowdfunding for the game here.